My favorite kitchen concoctions adjusted for high altitude cooking over 7,000 feet. On Mondays I bake bread. Don't I sound like a Pioneer Woman? Alas, that's about as far from me as we could be. The only kid getting home schooled around this joint is Bad Dog. Were I to hand out report cards, he'd be getting an F.
I love the methodical motion of kneading bread dough. Therefore! I'm very upset that a totally tasty loaf of bread can cost four or five bucks. Such delightful luxuries are no longer within my budget. These days, I make 'artisan bread' at home. I love this simple recipe and I especially love the fact that the ingredients cost me about... 50 cents! Good to go. It will rise more in the oven because this bread isn't punched down and allowed to rise a second time. 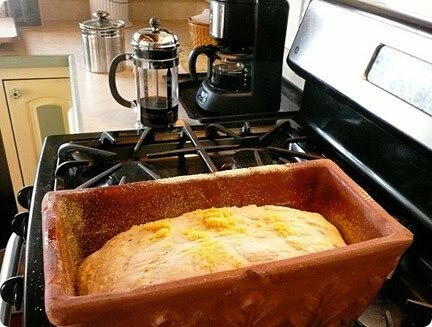 A sprinkling of cornmeal keeps the bread from sticking. * Named as such because I'm too cheap to go purchase a terracotta bread pan. 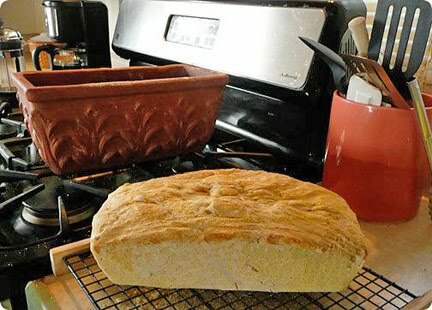 Breads bake up quite nicely in this old flower box. Using an electric mixer, combine the white flour, yeast, honey, salt and water. Mix for 2-3 minutes. Add the whole wheat flour while stirring with a large spoon. Sprinkle a little bit of white flour onto a bread board, knead for 10 minutes. (Great isometrics!) If the bread is sticky while kneading, simply add a little more flour. 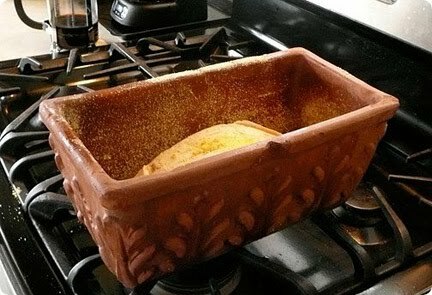 Place in a terracotta bread pan. Let it rise - perhaps an hour or so. Bake at 375 (F) for about 45 minutes. Easy peasy! Preheat the oven to 425, turn heat down to 375, pop the loaf in the oven, mist with a little spritz of water. The beginnings of high heat and the misting gives you a nice, crunchy bread crust. * A yummy, fat-free dense bread. ** This is a high altitude recipe that requires no specific adjustments for lower altitudes. You may find your dough requires more flour and it's okay to add up to another cup. Looks delicious - how was it?? I LOVE homemade warm bread and it also makes the BEST toast!! Greetings from Johnnny in North Dakota. I recently told my wife she had gotten a comment from you on her hibernating blog. Her name is Kit. now that is some gorgeous repurposing! I made this a couple of times and I love the recipe. I don't use the nifty terra cota pan, but it's still lovely. I plan to try to use this recip as a base for cinnamon rolls next. I live in Arvada, CO. Thanks!! Greetings from Park City, Utah! 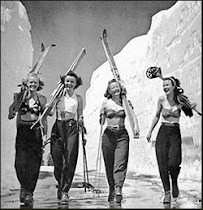 Skiing works up an appetite! Betty thinks high altitude cooking starts at 3,500 feet. No self-respecting ski bum would dwell lower than 7,000 feet. Relax. I've got your back. Here you can find my favorite recipe concoctions ~ all lovingly adjusted for high mountain living. 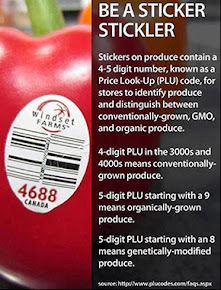 5-Digit codes, starting with #9 tells you this is organically grown produce. 5-digit codes, starting with #8 are the genetically modified produce we should avoid at all costs. Reduce each teaspoon by 1/3. * No adjustments needed with acidic (fruit juice, ex.) ingredients. Allow an extra 10 minutes. * Water boils much slower at high altitudes. No adjustment unless substituting, then 1 cup shortening = 3/4 cup butter or oil. * Increase 25 degrees (F) for metal dishes. Increase 25% per cup water, cook longer. * Boiling point is lower at high altitude and water evaporates faster. Decrease each cup by 2-3 tablespoons. 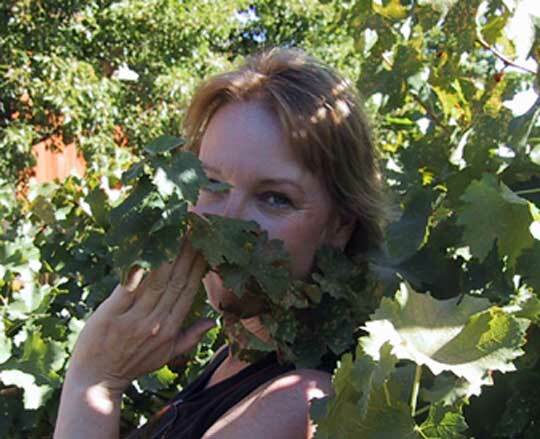 Certified master gardener, certifiable in many other ways. My garden is a labor of love high in the snowy Wasatch Mountains of northern Utah. TOUGH LOVE: I garden in a high plains desert forcing water-wise, mostly native, flowers to adapt to harsh, dry conditions. Or, they.. croak! Are You a Gardener? Me, too! Click the pic and come say hi. 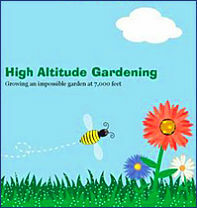 Copyright ©2006 - 2013 High Altitude Gardening, LLC, text and images. All Rights Reserved. Watermark theme. Powered by Blogger.